The following are a couple of ways to convert and combine your Microsoft Word, Microsoft Excel, Microsoft PowerPoint, Microsoft Visio, Microsoft Publisher, Bitmap, GIF, JPEG, PNG, Plain Text, Rich Text, XML and HTM/HTML files and documents, to PDF file format. 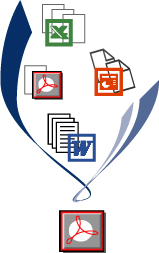 There are actually many PDF writer programs available that can convert documents through a print emulation program for both PCs and Apple computers. What these types of programs do when loaded on your computer is act like a virtual printer. Instead of selecting your normal printer for printing the documents, you select the PDF Writer program from the printer select area. One of these types of virtual printer programs that I have used is the pdf 995 program that allows you to create PDF documents easily for free. The cool thing about this type of program is the ability to select the print to PDF from virtually any program that you are running. That means, if you can print from a regular application, you can select the print to a PDF file, which converts the output to a PDF file and saves it anywhere you would like. The free version does display some advertising when used, but this really is no big deal. If you want the paid version, you can get it for as little as $9.95 or get the whole powerful suite for $19.95 to provide all the bells and whistles imaginable. By-the-way, you can also use this as a network selectable printer. That means, anyone that has access to the network can select the pdf 995 printer option and convert their documents to a PDF file. You can also combine multiple documents to form one PDF file. The latest Apple computer operating systems provide a built in writer version of a PDF conversion type program. Simply select the print menu from any Mac application, and then select the PDF drop-down menu item. Select: Save as PDF, Save PDF as PostScript, Fax PDF, Compress PDF, Encrypt PDF, Mail PDF, Save as PDF-X, Save PDF to iPhoto, or Save PDF to Web Receipts Folder. This is quite handy for all types of document sharing across Mac OS X and Windows operating systems. There are some other free online conversion places available, however some of these websites require you to give them your email address so they can send you the file. I have not taken the time to investigate if these sites are trustworthy to secure your information from online spammers or other types of privacy issues. In my opinion, there are other options available for free PDF conversions, that are secure with your email address and files. LOOP is a free web-based application that allows you to upload, convert and combine files to PDF. You do not need to install software or be working from your desktop computer. LOOP is delivered on-demand and available for use 24/7 through a web browser. You can read more about LOOP at Drawloop Technologies An import note about the use of LOOP with a browser based system is the great versatility that this brings to all software platforms. The software works on Windows XP or Vista just as easily as it does on Apple MAC OS X because it is Web based through the Firefox Web Browser. You can get the LOOP add-on and the Firefox browser from the Mozilla website. PDF files are becoming the standard for document sharing today. Having a file in the form of a PDF can make it easier for customers to be able to read and save sales literature, technical documents, manuals, and various other forms of publicity materials. Give these programs a try. I think you will like them. Internet marketing and SEO specialist.